If you are looking for good food fast, the Port Orleans Riverside food court is available all day long featuring fresh baked goods, pizza, pasta, hamburgers and some fantastic Southern specialties. 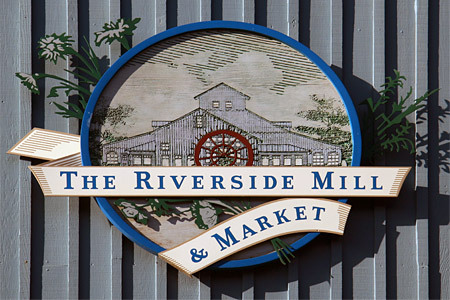 The Riverside Mill also features a country market with prepackaged items to grab and go. 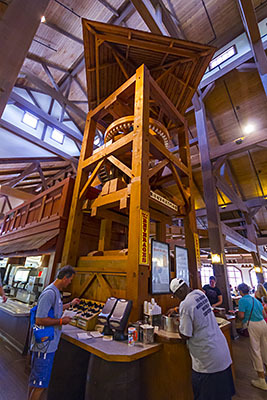 Soak up the scenery and the Cajun spices as you dine in this 450-seat food court near to the 35 (some sources say 32) foot water wheel that operates a working cotton press. 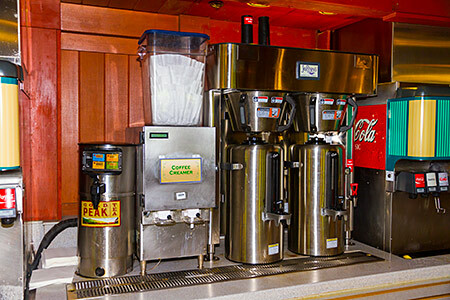 There are five serving stations which provide a variety of different food types — bakery/ice cream, grill, pasta, carved meats, pizza, etc — plus the Grab and Go refrigerator which contains chilled drinks and pre-packaged items. 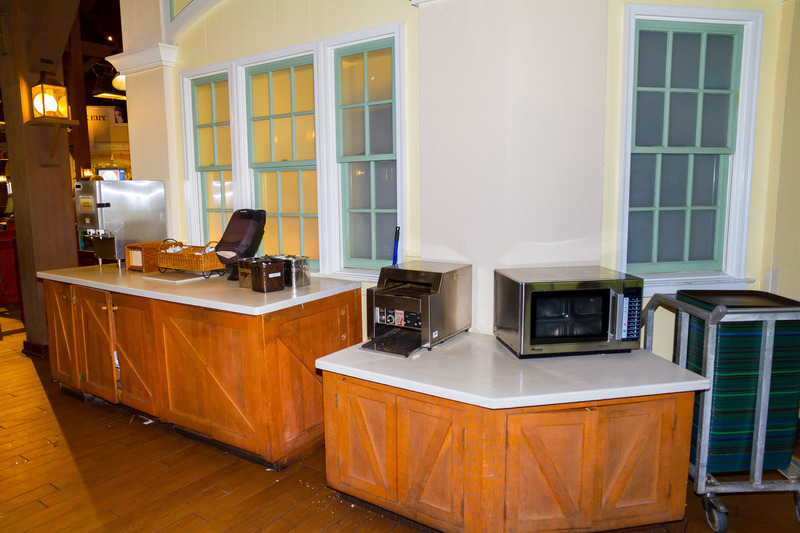 Once you’ve selected your food, you head over to one of the payment desks before collecting your cutlery, condiments and any dispensed drinks from the central island and finding a table. If your party needs items from different stations it’s usually easiest to split up, collect your food, and then all meet up back at the payment desk. This all works pretty well at quieter times, but at peak breakfast hours (say between around 8.30am and 10am) it can get very hectic with the lines for the different stations intercrossing with the payment lines. If you can plan to get your breakfast at a time when everyone else is not doing so, you’ll have a much more relaxed experience! One time-saving tip, especially if you’re planning to hit the parks early, is to buy cereals, pastries, fruit, milk, etc. the night before and have breakfast in your room — the maids will collect your tray and trash when they clean the room. Lunchtime is rarely crowed at the food court unless the weather is awful, and evening meal times tend to spread out a lot more as people return from the parks at much more varied times. The “Disney Dining Plan” is accepted at this location, but NOT the “Tables in Wonderland” discount card (however both types of discount are valid at Boatwright’s Dining Hall). Snack Credit items are indicated with a symbol. 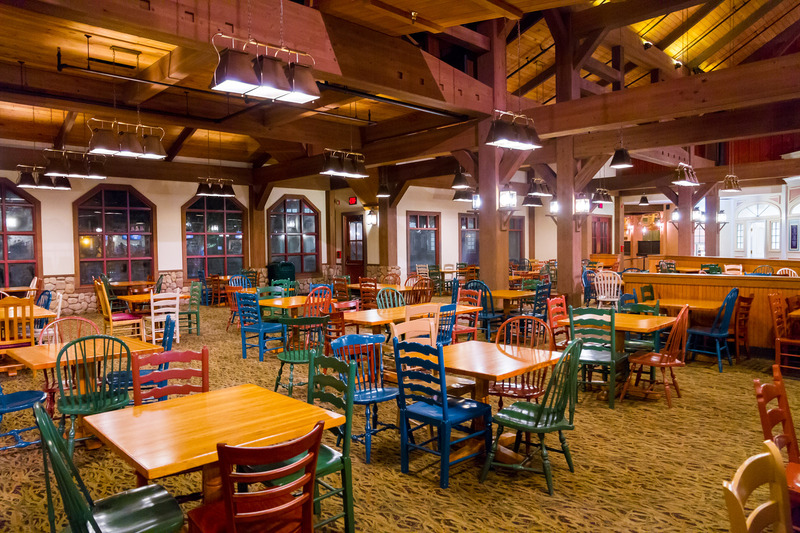 A limited-menu continental breakfast was recently made available at the nearby River Roost Lounge featuring pastries, coffee, etc. Very convenient for a quick pre-park snack with no lines. However this service was withdrawn after 26 Aug 2015. Opening Hours: 6:30am — 11pm (varies by serving counter, see below). Note: This has been reduced from the previous hours of 6am-midnight from mid-summer 2018. 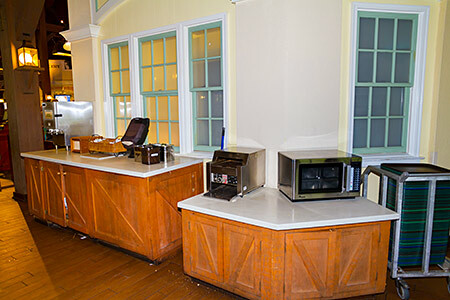 As a trial to accommodate guest requests, this counter has been remaining open until 11:40am to provide a selection of Breakfast options later into the lunchtime period. This will hopefully become a regular feature. Additionally there are other items displayed in baskets around the food court, such as fresh whole fruit ($1.69? ), confectionery, cotton candy, chips, pretzels, etc. which count as a snack item. All of the Walt Disney World resort food courts offer special refillable insulated mugs. 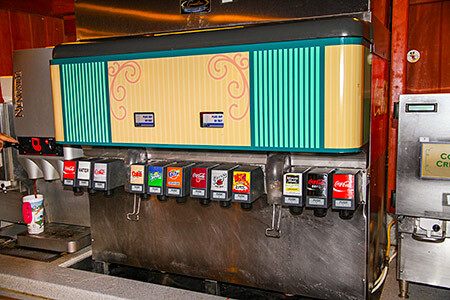 These can be purchased for a one-off fee (currently $18.99 for the duration of your stay) and they can be refilled at any resort beverage fountain station as often as you like during the valid time period, and at least one dispenser station is available throughout the night. Alternatively, you can purchase a disposable cup for use during your current visit to the food court only ($2.49?). 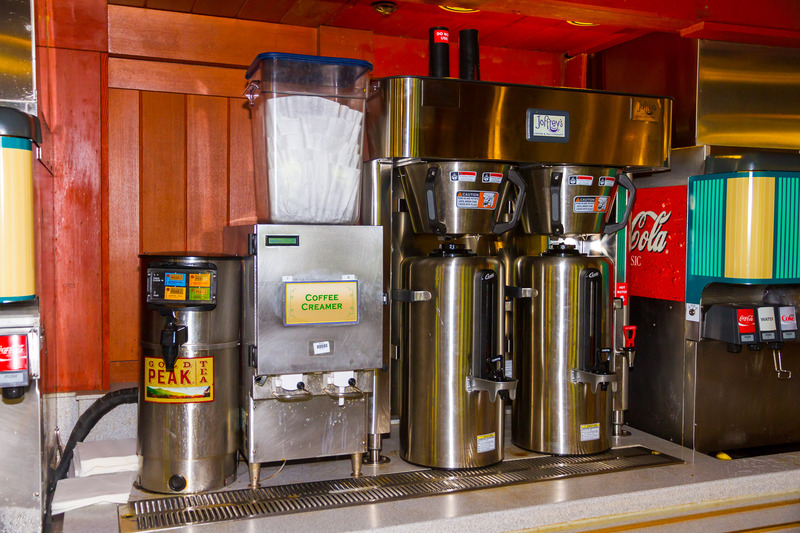 For more information on the “Rapid Fill” system, please see the Refillable Mugs page. 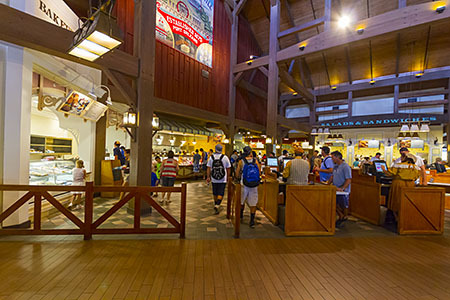 You can contact Walt Disney World directly to check or make special arrangements for specific dietary needs by visiting their information website at www.disneyworld.com/specialdiets, phoning 1-407-824-5967, or emailing Special.Diets@disneyworld.com. It is also advisable to contact individual restaurants in advance to discuss any specific dietary requirements you might have, and/or speak to the chef upon arrival. 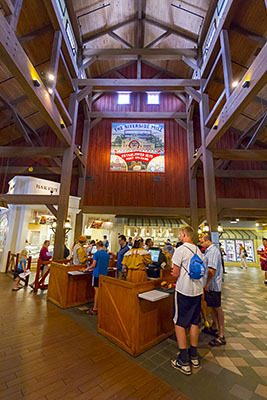 Another useful resource are the menus that have been uploaded to the handy Gluten-Free and Dairy-Free at WDW website.